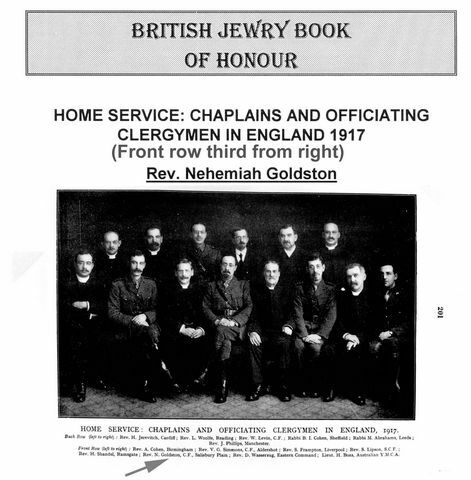 He was a Chaplain (4th class) in WW1 and served on Salisbury Plain. He then transferred to the 9th Russian Labour Battalion, Golden Hill Camp, Pembroke. 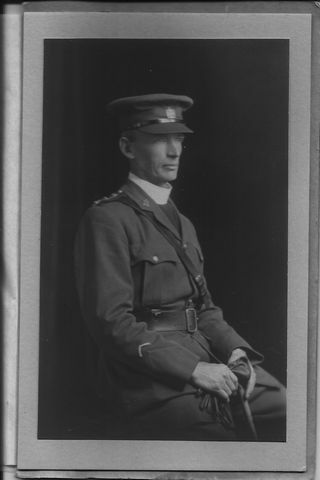 He relinquished his Commission on 1 September 1921, and was appointed Honorary Chaplain to the Forces. (London Gazette, 11 Oct 1921). to the Rev. Abraham Goldston and his wife Amelia. The family lived in the East End of London and he was educated at the Spitalfields Jews Free School and went on to become a Hebrew Master at the Westminster Jews Free School. From 1889-1920, he was the Minister of the South-East London Synagogue. He died on 26 October 1944 in London. He was 79. His son, Private Lionel Emanuel Goldston, The London Regiment, First Surrey Rifles, Army no. 2130 died on 30 May 1915 age 21 and is buried in the Guards Cemetery, Windy Corner, Cuinchy. His nephew, Rifleman Godfrey Levy, London Regiment, Army no. 415193 died 22 December 1917 and is buried in Roclincourt Military Cemetery. The Rev. William Lyttleton Pollock-Hill M.A. (Oxon) was born on 30 August 1866 in South Norwood to William Thompson Hill, a merchant in India and Annie Pollock, daughter of The Venerable Rev. William Pollock, Archdeacon of Chester, and Canon of Chester Cathedral. ministered to the poor in Liverpool were also relatives. He was educated at The King’s School, then in The Strand, London but which moved out to Wimbledon in 1897, and then at Keble College, Oxford where he adopted the name of Pollock-Hill in honour of his mother’s family of Pollocks which can be traced back to Paisley in Scotland and 1080 AD, and whose motto is “Audacity and Strength”. He excelled at athletics, both middle and long distance running, at Kings and Keble. Harold Abrahams OBE who won the 100 metres sprint Gold medal at the 1924 Olympics in Paris and was the hero of the film “Chariots of Fire”, described him as “one of the all-time greats, and my model, he had an amazing stride of 9 feet and a natural long legged rhythm”. Pollock-Hill won the One Mile and Three Miles at the Oxford and Cambridge University Sports between 1886 and 1889 in five out of six races, coming second in 1887. He also won the Cross Country for three years out of the four years he entered it 1886-9, but came second in 1887 as he had twisted his ankle the week before. He achieved the unbeaten record of winning the One Mile and Three Miles – this race by 80 yards- on the same day, a feat never equalled. He held the World Record for the One Mile in 1889 in a time of 4 minutes. He stood out as a runner, for due to a scalp disease he was bald by the age of 24. “Oh yes, back in 1890 wasn’t it? What are you doing now? He was ordained in 1891 by the Bishop of Oxford in Christ Church Cathedral and took up his first chaplaincy at Lambourne, Berks , the home of fleet of foot racehorses. His second curacy was at St Thomas and St Jude’s Church, Ashton in Makerfield, Lancashire from 1906-1916. He was then moved to Bigbury on Sea, Devon, within the diocese of Exeter. He had married Wynifred van der Zee Adams of Cork . 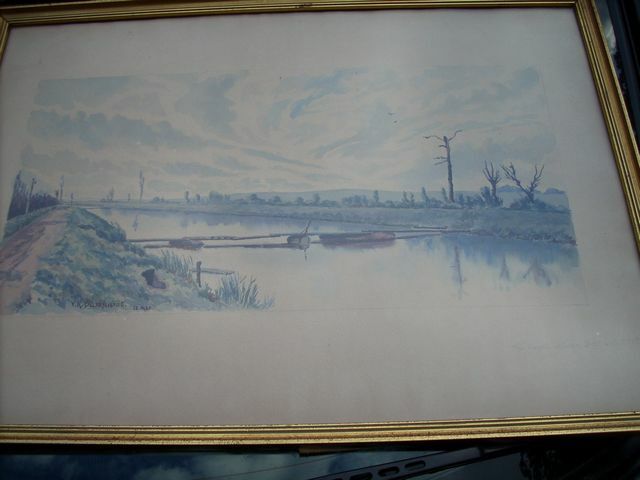 Valentine Rudolphe Burkhardt of the Royal Field Artillery , who painted on the 12 November 1918, the first day of peace, the desolate but quiet landscape along the Sambre canal between Oisly and Etreux, near Mons the scene of two horrendous but decisive battles in 1914 and 1918. Sunday 22 May 1920. He left Bigbury in February 1924 for Stamford Hill, North London, his final parish. He was President of the Oxford and Cambridge University Athletics Club in 1889, and chairman of the London Athletics Club, and wrote several letters to the Press complaining about athletics meetings being held on Good Friday and Sundays, which he felt should be reserved for God and Church. is buried in the churchyard of St Augustine’s Church, Broxbourne.